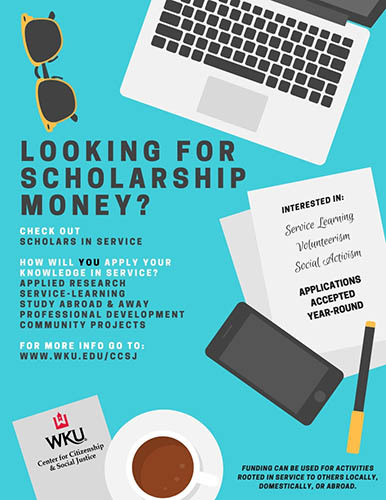 The purpose of CCSJ's Scholars in Service program is to encourage students to impact communities and begin to think about solving public programs through avenues available to them at WKU. Projects can take the form of applied research, service learning, volunteer service, campus or community events, or professional development. Projects that are rooted in citizenship, social justice, awareness and advocacy, or social activism are eligible for funding. Undergraduate and graduate students at WKU can apply. Projects can be completed locally, domestically or abroad. The CCSJ will receive applications throughout the year with deadlines for Winter and Summer terms set for Dec. 1 and May 1 respectively. Scholarship recipients are selected based on their ability to demonstrate a well-articulated vision, detailed plan, and high level of commitment to a substantial project-based learning experience. Projects must have a primary purpose of serving others and/or contributing to a citizenship or social justice cause. The Center for Citizenship & Social Justice (CCSJ) is a program committed to providing academic and extra-curricular experiences that empower WKU students, faculty and staff to address complex social issues in partnership with the communities we serve.